As if becoming an Academic All-American today wasn’t enough Ashley Luke broke the single season scoring record tonight for Western Illinois in the huge conference win. Ash now has 511 points on the season breaking the previous record of 504 points. Luke still has 3 games left in the regular season to add to her mark. In a big conference game Ashley had 25 points and 11 Rebounds tonight! This is her 17th Double Double on the season! Yes I said 17th Double Double this season! Your Laker Family is very proud of you Ashley. Luke named Academic All American! Congratulations to Ashley Luke who is a Sophomore at Western Illinois University on being selected to the Capital One Academic All American 3rd Team. Ashley is the first player in school history to be an Academic All American. Ashley is the only Sophomore and 1/2 non seniors. Luke is one of only 2 player to have a perfect 4.0 GPA. Ashley is having a tremendous season averaging 19.4 points (2nd in Conference) and 10.6 rebounds (1st in Conference) per game. She was selected as the Athlete of the Week three times this season for he Summit League and last year was voted Summit League Newcomer of the Year. Ashley was a member of the Wisconsin Lakers for 3 years. Couldn’t be more proud of her for her basketball and academic achievements. The link here will take you to Western Illinois Athletic site for the school write up on Ashley. Congratulations to Kari Clements a Senior at Wilmot High School who will be attending Minot State in the Fall to play College Basketball on going over 1,000 points for her career! Kari is the 3rd Senior for the Wisconsin Lakers who has now gone over the 1,000 point scoring mark this season joining teammate Mary Hirt and Emily Schmidt. Kari had 19 points in the game and to make it even better she did it in front of the home crowd on her Senior Night! Your Laker Family is very proud of you Kari. 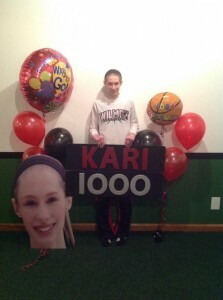 Kari is also now up for Wissports.net Athlete of the week. You can vote once a day per device, so spread the word and Vote for Kari. 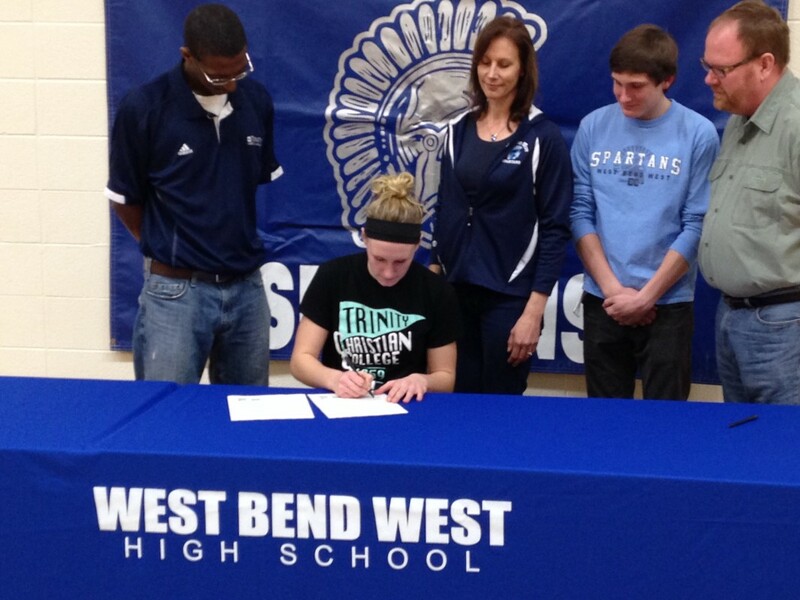 2014 5’9 Senior Celina Wanta from West Bend West has signed with NAIA Trinity Christian College to play basketball in the Fall for the Trolls as well as run Track in the Spring. Celina has been with the Lakers the past two years, she is a tremendous athlete, and a very hard worker. Celina is know for her defense and rebounding, no doubt will be a great addition to Trinity, and will present their school very well. Last night Celina signed after her game where she scored 17 points. Congratulations Celina your Laker Family is very proud of you!